In most states, you can renew your drivers license online, by mail or in person. However, be mindful that the online method is only available to certain applicants, depending on their age and citizenship status. During an online license renewal, you will be asked to identify yourself and pay the applicable service fees. To make sure that you are fully prepared to complete the process, you can download our informative online guide. Our guide contains everything you need to know to renew your driving license quickly and easily. In it, you will also get step-by-step details about how to complete other important licensing transactions, such as replacing your license or updating your name or address. The California drivers license renewal process allows the state Department of Motor Vehicles (DMV) to keep track of which motorists are currently allowed to operate vehicles on public roads. As a general rule, state drivers must renew their credentials every four or five years, and expiration dates are set on a license holder’s birthday. Despite the fact that many residents confuse replacements and DMV license renewals in CA, these are two different processes. While all motorists are required to renew their licenses from time to time, replacements only occur when these credentials are misplaced or become ineligible. In this article, you will learn how to renew a driver’s license in California, what the procedure’s eligibility requirements are and when you can start filing this request through the DMV. 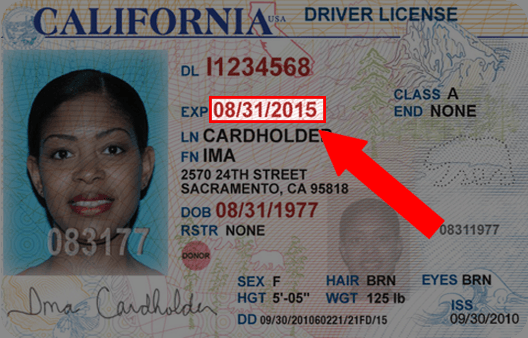 Note: Your California drivers license expiration date is also your birth date. Locate it on the front of your drivers license card. As long as you currently hold a valid driving credential that is approaching its expiration date, you will be able to visit a California drivers license office in person and request it to be renewed. However, be mindful that this does not include learners permits, which are issued to motorists who are younger than 18 years of age. If your driving credential has become ineligible or was stolen or misplaced, you will need to request a duplicate license rather than filing for a DMV license renewal in California. Furthermore, you will not be able to renew your driving license if it has been suspended, revoked or canceled. Instead, you will need to get your license reinstated. How early can you renew your drivers license in California? Because licenses in California typically expire every four or five years, you will need to request a DMV license renewal whenever those expiration dates are approaching. Moreover, the exact expiration date will be set on the birthday of a license holder, ensuring that it is an easy date to remember. As a general rule, you are allowed to renew a driver license as early as 60 days prior to its expiration. You cannot operate a vehicle if you have an expired drivers license in California. Thus, it is in your best interest to renew your credential before its expiration date. In order to maintain your driving privileges, you will want to renew your license no later than three weeks before it is set to expire, because that is how long it may take for the DMV to process your request and mail you a renewed credential. Renewing your driver’s license in California can be done via two methods: online or in person at a local DMV office. However, it is important to note that the online produce to renew a license has certain restrictions, thus disabling certain motorists from using it. To learn more about these renewal methods, read the sections below. In order to renew a drivers license online in California, you will first need to create an account on the state’s official DMV portal. This requires you to create a series of security questions and provide personal details such as your full legal name, age and Social Security Number (SSN). Then, you will need to provide additional information for the DMV to process a CA driver’s license renewal. For instance, you will need to provide your mailing address, which is where you will receive your renewed credential. You will also need to pay for the applicable DMV license renewal fees using a debit or credit card. Despite the fact that you will need to pay for the license to be issued, you will not be charged an additional fee for choosing to renew online. Once you have submitted the required information and payment, you will have to wait three weeks in order to receive your up-to-date license. Roughly two months before your license is set to expire, you will receive a California DMV license renewal notice. On this document, you will find instructions as to how you can renew your license. If you follow the instructions detailed on the notice, you will simply need to mail the form back to the DMV. On the other hand, if you do not receive a notice, you may fill out the “California Driver License Renewal” form (DL 410 FO) and send it to a specific mailing address of the state Department of Motor Vehicles. To renew your drivers license in California in person, you will be required to visit a local DMV office. It is important to note that you have the option of scheduling an appointment ahead of time through the state’s online portal. You will then need to fill out a Driver License Renewal form (DL 410 FO) or arrive at the DMV with the DMV license renewal notice you received in the mail. Either way, you will need to provide information such as your name, address and driving license number. You will also need to bring a form of identification, which can be your old license. Then, you will need to pay for the applicable renewal fee. Military service members and California residents who currently find themselves out of state may renew a drivers license online or via the mail. In addition, be mindful that military service members who fail to renew their licenses on time because they were serving the country during an act of war will qualify for a renewal penalty waiver. However, this waiver must be submitted within 60 days of the receipt date of a penalty. In general, you simply need to show your Social Security card to verify your SSN during a DMV license renewal procedure. However, you can also use a W-2 form that was issued to you within the past two years. To prove your identity, you may submit a certificate of birth or passport. In addition, you will need to bring two official documents verifying your state residency, such as credit card statements, bank correspondence and/or utility bills. As long as it is an official that shows your address, it will be accepted for you to renew your driver’s license. If you follow REAL ID drivers license renewal requirements in California and obtain this type of credential, you will find that it has a star on its upper right-hand corner. If you simply obtain a standard driving credential, your renewed drivers license will display a “Not for Federal Identification” message.